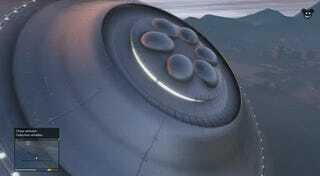 You can collect spaceship parts in GTA V. You can even spot some UFOs in-game, if you play your cards right. But now modders have found a way to make spaceships actually playable in GTA V, which is amazing. You can see the mod in-action in this footage by TwoDynamic—mostly, he just flies around Los Santos, but still! It's the same spaceship you can see in Mount Chiliad, when you get 100% completion in the game. The question is: which is better, UFOs or spider mechas?